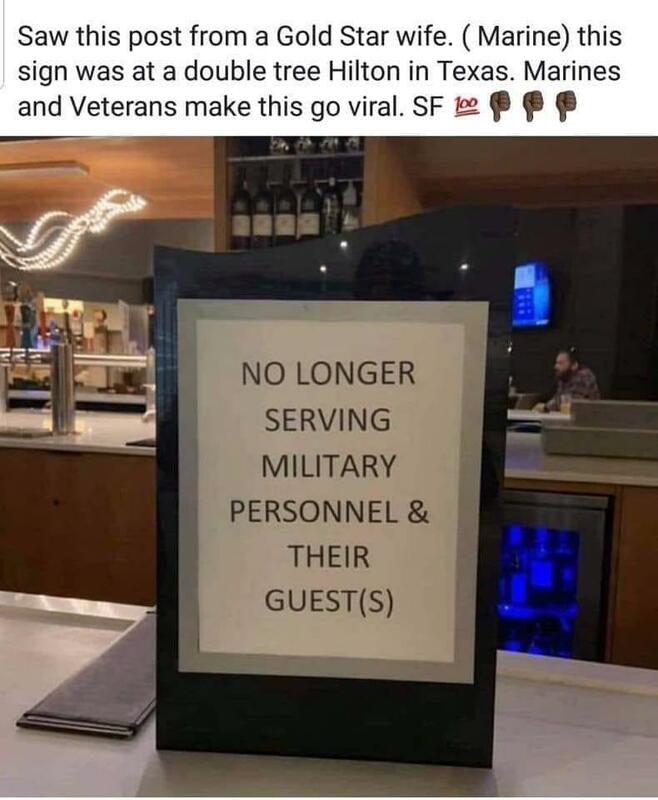 Did a DoubleTree Hilton hotel in Texas post a sign saying they were "No longer serving military personnel & their guest(s)"? No, that's not true: the sign was posted at a DoubleTree Hilton in Colorado Springs for a short time but the employees responsible are no longer employed by the property so there is no need to boycott the chain as many messages on social media are calling for. The DoubleTree by Hilton in Colorado Springs posted an apology to its Facebook page Friday afternoon for refusing to serve members of the military at the hotel's bar Thursday night. She and others who organized the event did speak with General Manager Daniel Kammerer about the actions of employees. Which as he stated in a Facebook post "two of our team members acted without proper authority to close and exclude military guests from our hotel's bar." Osbourne says she fully accepted Krammemer's apology. So there is no need to call for a boycott of the entire chain based on a screenshot of a message that even manages to put the hotel in the wrong state.